In May of 2014 it will have been five years since I graduated from Ohio Wesleyan University. Five. That’s a long time, and yet not. I feel like I haven’t done that much. Which is silly. I’ve done a lot. Which is why it took me so long to write my Reunion Note. I love how they gave three lines to “describe what you have been doing since your last reunion (use back side if needed).” Hahaha…. Right. I’m not even sure I could list all the places I’ve lived in the past five years on three lines, let alone what I was doing in each place. I spend a ridiculously long time writing this reunion note, mostly because I allowed myself to get distracted by what-have-you on the internet (and by working, and by climbing things). I’m not sure if this is a good sign for grad school, that it takes me three days to write less than a page about myself. How will I manage to write actual papers on topics that aren’t me? Oh man. Guess we’ll cross that bridge when we get there. So I thought I would share this with everyone here, since I’m assuming that most of my audience won’t be purchasing the OWU Reunion Yearbook this year. It was also a great excuse to go through some old pictures. (If you’re feeling extremely bored, just search “Lauren Smith,” and see how long it takes you. I may or may not be in the first 3,000 people that come up). Please describe what you have been doing since your last reunion. Since graduating from Ohio Wesleyan in 2009, Lauren has been all over the place. She has only once spent 6 months straight living in the same state, and it was a very odd experience. Working as a field biologist and an environmental educator, Lauren has lived in eight different states and one Canadian province. Most of her jobs have involved working with wild birds, though she has also been known to walk dogs and scoop ice cream (and no, she did not go to a special ice cream scooping school, she’s just that good). 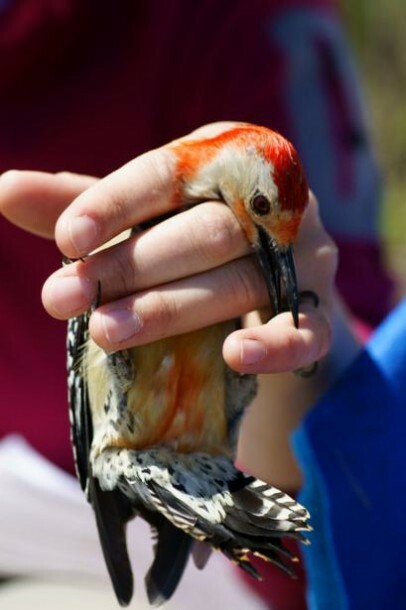 Red-bellied Woodpecker trying (unsuccessfully) to take a chunk out of my pinky. When she’s not climbing trees to study red-cockaded woodpeckers, getting charged by moose, explaining bird migration to small children, or getting pooped on and/or bitten by songbirds, Lauren is usually outside. When she’s outside and not working, she likes to climb rocks, go for long hikes, and look at birds. Sometimes she does go inside, and then she usually writes things, mostly for her blog: Tales from a Wandering Albatross (@wordpress.com)*. Lauren tends to travel as often as she can, both domestically and internationally. She is particularly fond of road trips through the American West and of trekking to Annapurna Base Camp in Nepal. The other parts of Asia she visited were also pretty cool.She also really likes southern Utah. Contemplating the Tetons. Paintbrush Divide, Wyoming. 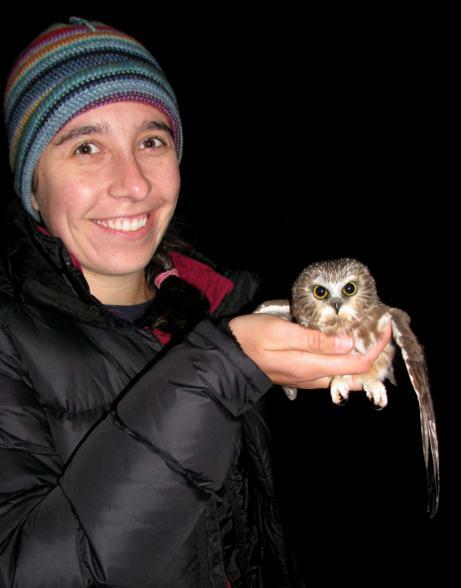 This summer (starting May 2014) Lauren will be going back to Jackson, Wyoming, to work with the Teton Science Schools as an avian research technician, where she will be primarily banding songbirds and secondarily educating visitors about bird banding and migration. 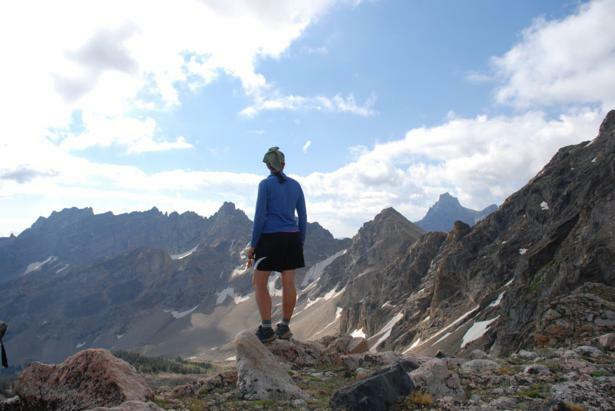 In August of 2014 she will start graduate school at The University of Montana in the Environmental Studies program, with a focus in Environmental Writing. *Yep, I totally just put a link to my own blog in there. Which hopefully you found, since you’re reading this on said blog… But, you know, just in case you needed help finding the home page, or wanted it opened in two tabs. You’re welcome. What is your favorite Ohio Wesleyan memory? I’m particularly fond of my memories of banding birds in Jed Burtt’s backyard. I have no idea why I decided to sign up for his freshman honors tutorial, The Microbiology of Birds. At the time, I wasn’t particularly interested in birds or their microbiology (and I might not have known exactly what microbiology referred to), but it sounded intriguing and I didn’t know any better, so I signed on. I can say with absolute certainty that this particular class influenced both the rest of my time at OWU and the rest of my life. It was that class that sparked my interest in birds, a spark that has turned into at least a Medium Fire Severity burn (standing trees are blackened but not charcoal; roots are alive below 1 inch; duff is consumed—I like birds, but other things can be interesting too). The degrading parrot feather crew at the NAOC in Veracruz, Mexico, 2006. Left to right: Kevin McGraw, Max Schroeder, Jenna (Sroka) Smith, me, Jed Burtt. 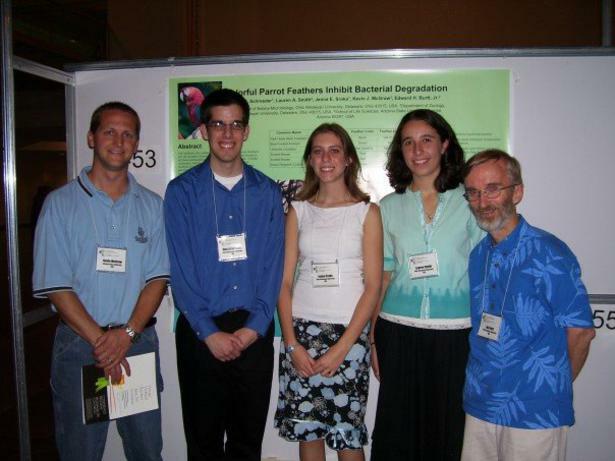 The research project I started in that class led to a number of ornithology conferences, where, in addition to learning about extremely useful things like hummingbird wing morphology and duck penises, I became much more confident in my public speaking and was exposed to the ornithological research community. That project also led to my zoology departmental honors thesis on parrot feather coloration (I’ll spare you the details), which hasn’t really led to much yet but sure looks good on my resume. I had no idea then that I would go on to spend the next few years after graduation studying birds all over the country. Every time I set up a mist net or hold a Black-capped Chickadee in my hands, I am reminded of Jed and all that he’s done for me. Thanks Jed. You’re awesome. 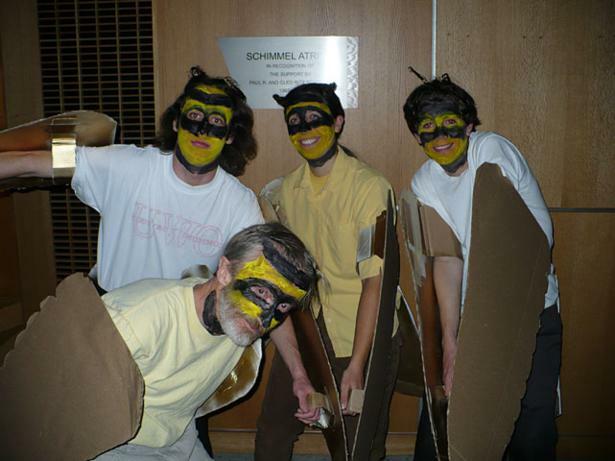 Left to right: Jed Burtt (front), Jack Stenger, myself, and Sean Williams. Bonus points if you can identify what species this flock is made up of. Hint: those are “horns” on our heads. Jed also makes superb spice cake, which may or may not have been the main reason I agreed to come back and mentor the freshman tutorial as an upper classman. I’m not ashamed to admit that I can be motivated to do a great deal for food. Especially Jed’s spice cake. Please include a current photo with your reunion note. Northern Saw-whet Owl. In my hand. Best day ever. Erie, PA, 2011. Yes, I know my “current” photo is from 2011. This was just the best headshot I could find. And it has an owl in it. Does your reunion picture have an owl in it? I think not.